Today we're visiting with Hank Phillippi Ryan, Agatha award-winning novelist of PRIME TIME, out this month from MIRA Books. I've just finished it, and it's a snappy and fast read! Charlie's also facing another dilemma: what happens when a top-notch TV reporter is married to her job—but begins to worry that the camera doesn't love her anymore? Hank: Oh, lovely, Dani. I didn’t know it would be so glamorous and extravagant! I should have dressed up a bit…And wow, look at all those red pencils…. Dani: Is the camera rolling? Oops. Ahem. Down to business. The first question everyone will ask you is, "how much of Charlie McNally is really you, the author and investigative journalist?" We might secretly want it to be a bit of a memoir. So let's take it from another angle: How much is NOT you? How are you and Charlie vastly different? But a couple of things: I’ve been a TV reporter for more than 30 years. (Yes, really.) And so it would be silly, in writing a mystery about TV, not to use my own experiences. Think about it—as a TV reporter, you can never be wrong! Never be one minute late. Never choose the wrong word or miscalculate. You can never have a bad hair day, because it’ll be seen by millions of people! It’s high-stakes and high-stress—literally, people’s lives at stake--and I really wanted to convey that in the books. There’s a huge been-there-done-that element to the books—I’ve wired myself with hidden cameras, confronted corrupt politicians, chased down criminals…been in disguise, been stalked, and threatened and had many a door slammed in my face. So when that happens to Charlie, it’s fair to imagine me. Although the plots are completely from my imagination, those are real-life experiences. Dani: You have three books coming out, one each in July, August, and September. That's a little unusual isn't it? How did that happen? Not that I'm complaining, mind you. It's nice not having to wait a year for the next installment. Then they decided to publish them as “back-to-back-to-back beach reads”, as they described it. One a month this summer, with the brand new AIR TIME as the third. (Sue Grafton’s wonderful blurb is on the cover) and then, the fourth in the series DRIVE TIME is out in February. It’s terrific, since all the books will be available. Apparently this trilogy thing is a hot new trend. I’m all for it! So if people love the Charlotte McNally mysteries, as you say, you can get the next one very quickly. Dani: I looked for your books in the mystery section, and though it's a cozy mystery, it was located in the romance section at Borders. It does have an ever-so-lovely Prince Charming, equally as important to plot and character development as the mystery itself. Did you intentionally set out to write a crossover novel? Or was it a marketing decision to have the books placed in the romance section? What's the scoop with that? Hank: I’ve checked various stores, and it’s often in romance, but just as often in mystery, or new fiction, new paperbacks. I guess that’s the bad news and the good news. The genre thing is fascinating, though, and a real insight for me into the business. I think of the books as mysteries. Absolutely. But there is definitely romance involved. Did I set out to write a crossover? Dani, when I started writing, I had no idea what a crossover novel was. I just had came up with what I thought was a great story, with an original plot and I wanted to tell it. It never crossed my mind what to brand it, or that it would matter. Just the way life should be, right? Dani: How about a book trailer link, Hank? Hank: Trailer in the works! Coming from the marketing geniuses at MIRA, wonderfully. What it looks like? I don’t know yet! You’ll see it as soon as I do. Dani: First chapter read? Other cool stuff? Hank: Excerpt on my website! Cool stuff on my website. Blogs: Jungle Red Writers and Femmes Fatales. 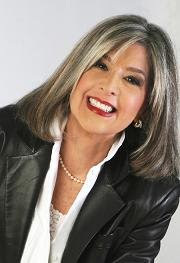 On Facebook as Hank Phillippi Ryan. And on Twitter. Hank: Final thoughts: You know when I finished writing PRIME TIME, I called my husband into the room, and said “Sweetheart, watch this.” Then I typed: THE END. And then I burst into tears. But I was wrong to cry. It wasn’t “the end” at all. It was just the beginning. Dani: Oh, Hank. Where's my hanky? Okay, stop that! Now here's another cool thing, readers. Hank: I still have five ARCS of PRIME TIME. Should we give them away to lucky readers? Just email me, and the first five will receive them! Dani: Thanks, Hank. FACE TIME is next for me. Can't wait! Okay, I admit - that romance you have started might be exerting a tiny bit stronger pull than another great mystery. Or maybe not. The reviewer was so right – the perfect combination of mystery and romance. Oh, and where to buy a copy of the book? 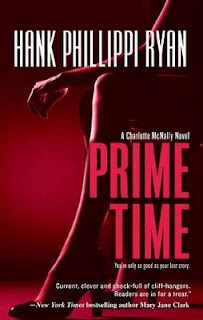 You can purchase an autographed copy with free shipping from Mystery Lovers Bookshop, where Prime Time is Number One on their June bestseller list. And guess what? 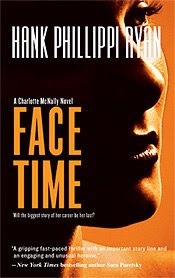 Book 2 - FACE TIME - comes out on Tuesday! Click here to buy. Did I say free shipping on all Hank's books? Brought to you by Dani Greer, founding member of the Blood-Red Pencil and passionate reader of cozy mysteries. Dani, I love your interviews. Always such fun. Lovely to meet you Hank. All the best with these back-to-back-to-back releases! Thanks, hearwritenow! Don't forget to enter for a free books! Definitely a fun interview. If I weren't one of the editors here on B-RP, I'd be emailing for one of those ARCs, for sure. I think the back-to-back releases is smart. Even the slowest reader (by slow, I mean the one trying to juggle a mai tai on the beach in one hand and your book in the other) can read one a month. For some odd reason, the idea of your husband interchanging you for Charlotte is funny. I think that means you definitely got the character right. Wonderful interview on both sides. You two sure had fun and it shows. Very entertaining. Yes, Helen, I agree--the three in a row releases is wonderful.. and its great to have all the titles available at once. Allison Brennan has it, and Brenda Novak--and it's certainly been terrific for their fans. The TIME books are standalones, really--even though they're chronological, you could start with the third one and then go back to the beginning. WOuld any of you do that? Or would you feel you definitely need to read the first in a series first? Great interview! Used to watch you all the time before I moved to FL. I can actually relate to the crying of finishing the manuscript, but what did you do once the tears were gone? I always try to read series from the beginning. That way I don't run into any accidental spoilers. For example, if Joe's life is at stake in book 1 and your read book 3 first, where Joe takes his son fishing...oops! Suddenly book 1 isn't so suspenseful. Great interview Dani and Hank. Terrific interview, you guys. You're both so funny! Feels very natural, too, not at all forced. Hank, good luck with those releases. Sounds like you're on your way! Hank, I prefer to read a series from the beginning. As Charlotte said, sometimes there is something in a later book that spoils a part of a sub-plot in an earlier book. Plus, it is always fun to go on the journey with the central character from the beginning of his or her life experience. Terisa, that's so funny! Little did I know you were out there watching me on TV. Thanks. Denise--let's see. Once I stopped crying: I probably looked in the mirror and tried to figure out how to get rid of my puffy eyes. After that, I think I went to the Kinkos to get a whole copy printed. And (because I was such a newbie I hadn't numbered the pages) I was shocked to discover it was 723 pages. Charlotte and Maryann--yeah, I usually start from the beginning, too. But with FACE TIME or AIR TIME, you could really read them first, and not have any spoilers when you got back to PRIME TIME. Except one. There's one. But even so, it would allow you to read book one knowing something that Charlie doesn't know--and that might be really fun. Kind of like when you make a new friend--and later you learn something that makes you realize it's a small world. Susan--thanks for the kind words. We shall see. Hi, gang, I'm glad to see you had fun. I thought I'd be back from the city earlier, but got LOST in some horrendous weather. Hail, flooding, wind - I was yelling to my guardian angel! You can keep the beer - I'm having a gin & tonic right now! BBS. Whoa, Dani. Hope you're safe and dry. We did open a couple of bottles of champagne around here at the BRP, hope that was okay. And thanks for inviting me..we all had a dandy time! See you all soon.. and much love. And Helen? You got one. Just email me your address..